Each year we make ginger bread houses, and we always have a bunch of friends joining us for this fun activity on a December afternoon. Since I have made ginger bread houses since I was a little girl, I typically pre-assemble the houses using melted white sugar, it is fast, it is strong and edible of course. However it is NOT an activity to involve children in as the sugar is very hot and it burns quickly. I buy a bunch of candy on Nov 1, taking advantage of the 75% off sale on Halloween candy, to keep the costs in line. I buy pre-made houses at IKEA to keep the stress level low, when I was a child we baked one day and decorated the next. Most stores sell pre-made houses and after Christmas I pick some up for cheap, put them in the freezer and pull them out when we are ready to decorate. I use mini muffin pans to put various types of candy in each 'slot' and let each child have their own house and muffin pan. For 'glue' I use either home made icing that I put in a small plastic bag or if I have found a good deal on tube icing that is what we use. Since I have boys our houses are not as neat and pretty, they are more akin to castles, forts and armored bunkers, but it is still fun, and a great way to spend time with friends. My Comments: Thanks so much for this idea and cute picture, Christina! 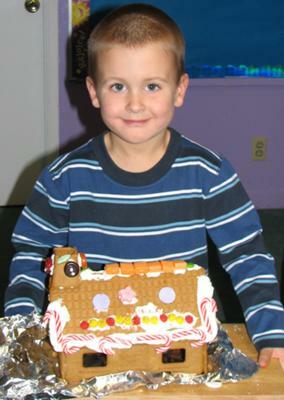 We love making gingerbread houses at our house too. So far I have just purchased the kits on sale and not made our own. Maybe we'll have to try that. That's a great idea to assemble them the day before. We have had quite a few collapses trying to put the houses together on decorating day. I found a plastic tray that has grooves in it that hold the house pieces in place. This works well for assembling the houses and holds them in place while they are drying. I never thought of making it a group/friend activity. That's a fun idea too. Thanks for sharing.